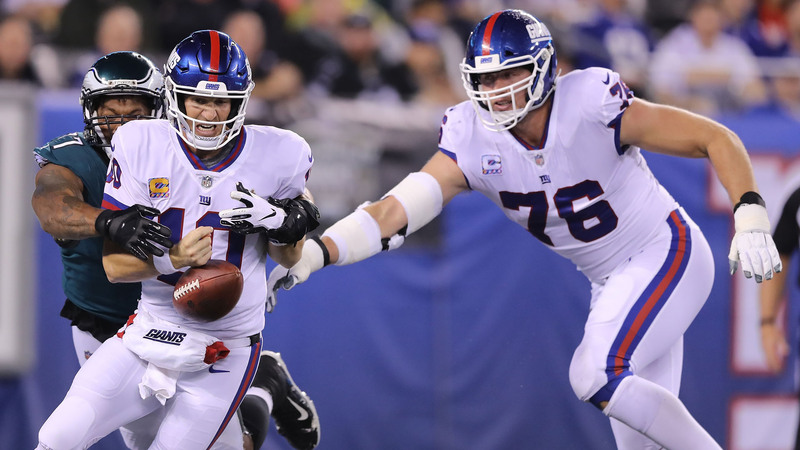 It “bugs” quarterback Eli Manning that the Giants are 1-5, and after a 34-13 loss to the Eagles on Thursday, the former No. 1 overall pick was introspective talking with reporters Friday. Manning was 24-of-43 passing for 281 yards with an interception in New York’s most recent loss. He has thrown for 1,662 yards with six touchdowns and four interceptions on the season. The six touchdown passes through six starts is his lowest total since he was a rookie in 2004, but it’s the team’s record that bothers Manning more than his touchdown passes and public outcries for his benching. “It bugs me that we’re 1-5,” Manning added. “What people say never got to me, never bothered me. But you work extremely hard to go have a big year and you’re excited about things, and to be in this situation, yeah it bothers you and it’s tough. The Giants new head coach Pat Shurmur was at the helm of a Vikings offense that was in the top 11 in total yards, passing yards, rushing yards, points and points per game last season. New York’s offense through six games under Shurmur is fifth in total yards, but 28th in scoring.